The tally of marvels unearthed at the Fehmarn Belt Link tunnel construction site on the Danish island of Lolland seems to get longer every weeks. We can now add a flint axe with an intact wooden handle to the flint dagger with the intact bark handle and the 5,000-year-old human footprints around the hazel stick gillnets. The axe is about 5,500 years old, around the same age as the footprints and 2,500 years older than the dagger. 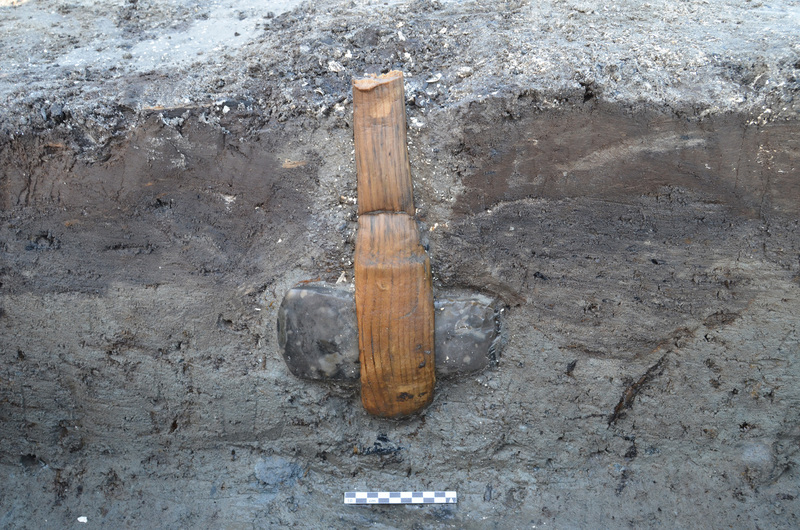 Only eight complete Stone Age axes with the full wooden handle preserved have been found in Denmark before now. All of those were discovered in peat bogs. This is the first example discovered on the site of a former fjord lagoon. Jammed into the dense clay of the seabed, the axe was covered in layers of sand and soil that kept oxygen away and waterlogged the organic material, keeping it moist and intact. Museum Lolland-Falster archaeologists discovered the axe stuck vertically 30 centimeters (just under a foot) below the sea floor east of the harbour town of Rødbyhavn. It was not the only artifact found jammed into what was then the seashore in a vertical position. There were numerous wooden candlesticks, two oars, two bows, eight spears and 14 axe shafts. There were also deposits of ceramic objects and animals. In one grouping they found 60 jaws from different animals and two axes made from red deer antlers with fragments of the wooden hilts in the shaft holes. This was the only complete axe with both head and hilt in perfect condition. Axes were important tools for Stone Age people, but particularly so around the time when agriculture was introduced to the region. In order to begin planting things, people had to clear the virgin forests that covered the country. The establishment of stationary agricultural communities engendered new social hierarchies and religious rituals. Wetlands were a consistent locus for cultic practices, and burials and sacrificial offerings testify to how important these liminal grounds between water and land were to the people who lived near them. The proliferation of vertical objects excavated at Rødbyhavn are a prime example of a coastal area being used for offerings. These objects, all of them with significant practical uses and value, were planted into the clay as part of a ritual sacrifice. Their deliberate placement and the lack of any utilitarian purpose to the Stone Age people burying their stuff and animal bones in the shallows identifies them as religious deposits. Excavations will continue until next summer when construction on the tunnel begins and these precious sites will be bulldozed away. Archaeologists hope what they find in the upcoming months will lend them greater understanding of Stone Age religious practices. This entry was posted on Thursday, November 27th, 2014 at 10:40 PM	and is filed under Ancient. You can follow any responses to this entry through the RSS 2.0 feed. You can skip to the end and leave a response. Pinging is currently not allowed. This reminds me of the boon to British archaeology of the coming of North Sea Gas. Instead of every city and town having a local gas works, there was the need to lay pipelines all over the country – which functioned as so many exploratory archaeological trenches. How was the flint secured to the wooden handle? The blade was presumably secured to the handle with ‘resin’, ‘fibre’ and/or leather stripes. Check out the W’pedia article on ‘Ötzi’, who was in particular found equipped with an axe, which -in his case- had even a state of the art copper blade instead of flint. Of course, his advanced equipment was rather alpine than maritime, but it might give a good general overview: Scandinavia can get chilly as well. I just can’t believe how fantastically well the handle is preserved. What a find! As to attachment~ Here’s the deal. This tool was used in the way we use an axe- to chop wood, or lop limbs(game or enemy), or possibly to punch a hole in ice for water/fishing. BUT- it is not attached in the way of a grooved stone axe(which is in a forked handle, and used resin and lashing). THIS- is a celt type tool head, which is inserted through a hole in the handle, and is ‘self tightening’ through use. Each blow sets the blade tight by pushing it back into handle. Note the taper from wide end(blade) to (rear) skinny end. This allows the tool to be ‘taken down’ too, you pop the back end and the blade comes out. Critical difference in celt handle- the top and bottom of handle hole hold the bit. If the bit puts pressure on sides- it breaks the handle! All blows need to be nice and straight, any twist at angle of impact will break your handle. the type of axe is called a Celt and the act of chopping is what secures the stone in the haft. The stone is caught between the top and bottom part of the wood without touching the sides.